"Excellent tool for deploying Git apps to AWS"
Deploybot has become an integral part of our workflow due to its ease of use and seamless integration with the services we use. Commit, push to Bitbucket, pull open Deploybot, and the latest version of our app is ready to deploy. It handles the update on Elastic Beanstalk seamlessly and allows VERY easy rollback if there's bugs or errors. By far, the fastest site update/CI tool I've used. Also has an automatic deployment feature based on keywords in the commit, but we don't use this. Honestly, there is nothing *not* to like here. This service works, works well, has very low friction. a) Use Git for version control. b) Use AWS or Elastic Beanstalk. Check out Deploybot. It saves countless hours wrangling a CLI interface and handling app upgrades/downgrades, seamlessly integrates your Git setup with your AWS setup, and makes it super easy to keep track of which version you currently have deployed and where. Primary problem solved is reducing the friction to deploy current version of our app to our servers. this takes minimal time, doesn't have the configuration overhead of the Elastic Beanstalk CLI toolset, and cleanly connects our Bitbucket repository with our Elastic Beanstalk application. It's the missing link. "Modern deployment solution with not-so-good Docker support"
1. Good guides - Deploybot has very good documentation for deployment guides, which is very helpful while setting things up. It is a growing repository which shows all the steps for building projects like Laravel and uploading automatically to VMs provided by AWS or DigitalOcean. 2. API endpoints - API endpoints let you programatically trigger a build or list/edit/delete those. While we create the builds by hand, the build triggers are used for connecting with other existing automated workflow, that we already use. 3. Building and compiling assets before deployment - Deploybot allows for building and compiling code using a script before deploying it to server. This removes the need for a separate such service or building every release before pushing to git. 4. 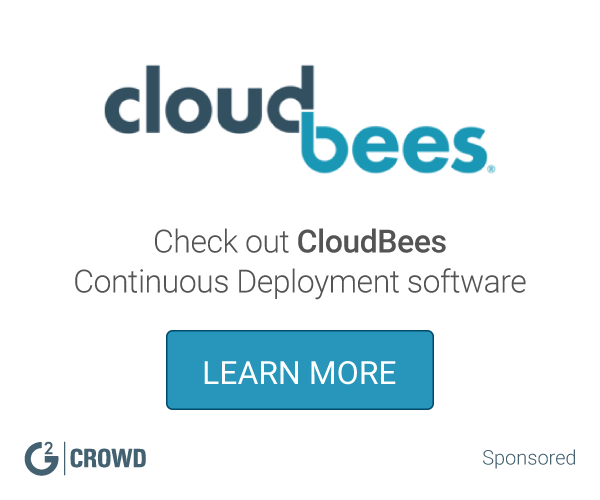 Watch deployment progress in real time - Viewing the deployment steps occuring live along with full console output gives you the same flexibility as the older self-hosted deployment solutions. It is also easy to cancel the ongoing process at any time if anything seems wrong. 5. Rollback a release - Accidental or buggy releases can be easily rolled back with a single button, but it still takes some time to get the older release up and running. 6. Deploying without accessing servers is possible by users with low privilege access. Also, good thing is that the release notes gets shared with everyone team so that people can have a overview of all the development going on, even if they are not directly working on it. 1. Deploying using docker container is a bit cumbersome - it takes a whole different section of configurations to be filled up which is not consistent with rest of the process. Many docker deployment integrations like Google Container Engine are currently missing, making the whole thing a half-hearted solution. 2. Docker hub integration is non-existent - so you cant directly pull updated docker images from docker hub or other hubs. They contain very well maintained packages, so it is a shame that you'll need to have a custom solution for using them or use static packages instead. 3. Windows-based hosts not supported - Windows have recently announced partnership with Canonical and released docker support on Windows. This is a really great development as it allows cross-platform development on the docker platform, which is essential for enterprises with large user base. But unfortunately Deploybot doesnt support Azure to make full use of this potential. Deploybot is clean and easy to use - so definitely give it a try if you are looking for modern options. But unfortunately its docker support is still quite naive. As it has good Rest API support, you can still do the job though if you can write scripts for that. Our firm is using a Docker-based solution for deploying the documentation servers. The documentation is extracted automatically from the codebase using sphinx scripts. We needed to update this documentation on code changes. This is where Deploybot comes to help - it gets triggered on code pushes, and then runs the script to obtain the documentation from it and releases that to our AWS hosted servers. It is an automated solution to a small problem that pestered us for a year. 1. The clean user interface. 2. The possibility to build assets using Grunt or Gulp. 3. Fast and Reliable, DeployBot instantly detects Git pushes and deploy changes to the server. 1. I can't access to support and guides from the dashboard. 3. Hope they had "Quick reset" to previous commit. 4. Every time i click login, i have to input everything .. i wish the "remember me" option works properly for me. DeployBot is very easy to use, i suggest to give it a try .. they have a free plan while you can setup a sandbox and start playing. DeployBot helped us to save a lot of time maintaining our websites .. every time we push a commit to the dev branch, we can instantly preview the changes on the staging website .. after merging develop to master branch, Deploybot will build assets using Gulp then push changes to master .. changes will be applied instantly to our website.. Just like magic. "Good enterprise deployment option, but cannot be self-hosted"
As a Enterprise user of Deploybot, I like a few solid things about it, which are a huge improvement from older softwares that we used to be trained in. Accidental releases can be avoided and rectified quickly with real-time rollback available in Deploybot. While the deployment is in profess, it can be stopped accidentally as soon as something feels out of place or errors occur during this process. Rollback takes place within 30 seconds, which is a impressive timeframe for me as I have mostly dealt with other tools which can take upto 30 mins for this. User Access Control is very important for us, as we believe in a strong hierarchy model for protecting access of sensitive/critical content for new recruits. Team leaders have full power of the project assigned to the team and higher administrative staffs have a overview of all projects, but not direct control over them. Deploybot has easy configuration options in their UI to make all this and even more possible. The biggest drawback about Deploybot, that our administrators feel is not having the option of hosting it on our own servers. As we have huge number of users and their privileges are already maintained via a different service, having it hosted offline with some way of mass editing user lists is very important to administrators. That also means we wouldn't have to pay per user, but instead by a fixed mass pricing. If you are an enterprise user and feeling a little bit hesitant in jumping in this new water, I would say from personal experience that it is quite simple to get started with once you know the basics of how any deployment works. Their visual documentation is also very good for getting new users acquainted with it. One of our major customers wanted us to handle deployment of their services via deploybot, as there staff is already familiar with it. Although it was a new service for us, some of our programmers were already familiar with it and they handled the responsibility of educating the other team members on how it works. That project has been fulfilled and we are providing support for it for about a year since. "Docker-based deployment solution featuring nice workflow"
One of the recent docker-based deployment management platform with in-built testing is what best defines Deploybot. It supports many programming languages like node.js, java, python, coffeescript, etc. out-of-the-box and the default configurations for these languages are very useful to get started with. It is quite easy to start with the defaults and then customize it for more complex scenarios. It supports many sets of configurations for different branches of code like dev and master, which makes sure that untested or beta code dont get pushed to production. At any org level, this is a critical feature. Builds are triggered automatically or manually, then build steps can be configured and to my surprise, it doesnt just tell you to write bash scripts but instead reads your project config files to setup/integrate automatically with tools like grunt, gulp and npm. Although it doesnt cover all the tool sets, I hope that'll only get better over time. Deploybot is quite nice, but some of its features seem to be limited to only the popular options. Deployment integrations cover the most popular ones, but Rackspace and Openshift were missing in the list, to my disappointment. Language Support is also limited to a few and if you have a old-ish stack of C++ or even Haskell, you have to work much harder to get things running. Also, notification to mobile via sms or email should be another basic feature that it doesnt have. Managing teams with different access levels in not possible, making it a insecure option for larger organisations. Deploybot is a new alternative to the the legacy deployment platforms which needed to be self-hosted and it is quite nice for simple deployment cases as long as the projects are built on modern languages / tools. It is still not a substitute for old codebases or projects which support all platforms. Deploybot was decided as our choice for deployment of internal services and small client solutions after a lot of team discussion. Although it has a few problems, it is good enough for simple tasks. It immensely helped reduce our communication clutter about deployment with everyone getting a clear overview and history of all deployments. We mark our important releases with labels, so that they are much easier to refer to - it was previously a huge problem as there are multiple deployments scheduled even within an hour. "Very easy auto/manual deployment tool with loads of integrations"
Deploybot is a visual solution for your deployment schedules and records, which can be triggered automatically from code repo and finally deployed auto/manually. It also makes rollback pretty easy when deployments go wrong, along with nice overview of what changed in that deployment. 1. Huge set of integrations - From code hosting providers (Github, Bitbucket, Gitlab or any git repo) to deployment platforms (FTP, AWS, DO, Heroku, Shopify), they have pretty much all the ground covered for 1-click integration with popular services. 2. Performance monitoring - Each deployment can use monitoring services like New Relic and Bugsnag, which integrates right within the UI to give developers a one-stop place to keep in touch with everything. 3. Auto/Manual deployments - Every code push to master will test and build the code, then either automatically deploy it or queue it for review from user. This is a nifty feature as it allows deploying the push after some manual testing and monitoring to make sure that faulty things dont pass right through the automatic check. 4. Release Notes Management - Prepares automated release note for every push to production and it is shared with everybody in the team. 5. Docker-ised testing - All build code are run within containers, giving you faster startup time and nice separation from the OS. 1. High Pricing - Basic Plan starts from $15/mo for single user, which is quite a high price for just trying it out. 2. If the deployment integrations dont cover your hosting provider, you are a bit out of luck. Writing shell scripts for that is possible, but quite a pain compared to the 1-click experience. 3. No email notification option alongside chat notification services. It is a simple tool with good UI and dashboard notifications, so basically a very handy tool for non-developers to keep a tab on the deployment procedures and start/stop/rollback deployments to the server. We're trying to simplify our IT operations stack a bit by moving from our own hand-written tools to some popular hosted options which are simple enough to be used by managers. Deploybot seems to fit the bill, so we've put it into use on a trial basis. We're not looking forward to put our complex deployment flows on this platform, but for simple client services we build, it is more than adequate. IT team also likes it. "We Couldn't Live Without Deploybot"
Deploybot makes deploying code a breeze. It's easy to set up multiple servers to deploy to, there's numerous ways to connect (FTP, SFTP, SSH), and you can integrate with Github, Bitbucket, Gitlab, and self-hosted git servers. You can select the branch that you deploy from, they can be automatic or manually triggered, and rollbacks, when needed, are simple. The interface is intuitive and the price is reasonable. Occasionally the service gets interrupted (DDOS attacks or other internal glitches). These can be really frustrating, when you need to push code out. Remember that there are times, however rare, that the Deploybot servers are down. Make sure that you have contingency plans, in the event that you NEED to deploy while they are not accessible. We wanted to manage the deployment of code from within our version control workflow. Deploybot fit the bill perfectly. The price was reasonable and the integration seamless. The result is that our workflow is streamlined and the code that makes it into production is better, so there are fewer errors, and when they do occur, they're more easily handled. For something like this, a free tier was perfect. It's very good, but if your project is extremely complex to deploy, I think it's better to keep it in-house. Deployments are handled by the service rather than by our servers. It's just one less thing to migrate when we do so. "Mostly great with some minor hicups"
When it works, it works amazingly. Fast and secure. it takes a boring manually process and makes it easy and fun. Nice that it connects with GitHub and Bitbucket and can also use private keys to connect with multiple servers and environments. Supports Atomic deployments too! Some networking issues have occurred like unable to connect to external services. Error messages could be better. Occasionally the service will be down and it can be hard to get hold of the support team over the weekend. Try it for a month and see if you like it! Now I can't live without it. Automating deployment for all of our websites while building the assets from source and only deploying exactly what is needed to the servers. "DeployBot is exactly what I was looking for"
I love DeployBot's ability to link with GitHub, deploy without downtime, and revert easily. I use DeployBot for the pretty simple purpose of deploying to my site over FTP from my source repo. Previously I updated my site via drag-and-drop with a local FTP client, which was error prone and tricky to roll back. DeployBot adds the right structure to this process. A mobile-responsive site could be nice if I ever realized I needed to quickly roll back a site while I was away from my computer. If it looks promising, just give it a try—super simple to set up. I can deploy my websites with a lot more confidence now. "Works great for static content"
For basic web sites, Deploybot is extremely easy to get up and running and easy to explain the process to non-developers (like marketing folks). The traceability of deployments is also really nice. For more complex web applications which have a build pipeline, like compilation, compression, unit testing, etc., Deploybot really falls short since it serves solely as a pipe between source control and deployment environments. Trivial to maintain a marketing site. I was able to tell a colleague to simply check their changes into this repository to see it go to the staging site, and with 1 push of a button, push the changes up to production. "Deploybot is my choice for CI and CD"
The ease of managing multiple repo's and the easy integration with different infrastructure providers. The manual deployment flow. It's quite long and involves a lot of steps. If you are looking for a simple tool that helps you manage to push to deployments. Run a bunch of maintenance and routine tasks each time a deployment completes. This is the correct tool. It takes care of the overhead of having to manage different service hooks , configurations etc and lets you get things going in a few mins. Also, integrations to Slack makes it easy to notify the rest of my team on each deployment so they are aware of what's deployed where. Easy to set up a deployment from Git to FTP and optionally include build tasks. Does not support .NET Core out of the box - you would have to configure the VM with an install script. Think about what you are wanting to automate CI/CD for. Make sure this ticks all the boxes and whether something like Heroku would be more appropriate. Deploybot allowed me to automate deploying updates to WordPress templates via FTP. "Easy to configure, Just works." Deploybot is really easy to configure and gives a lot of flexibility by allowing you to define your deployment scripts. While we were using Deploybot it sometimes was a bit delayed, in very rare cases it started the deployment minutes after a push to the connected repository, that was a bit annoying in some environments. Deployment of multiple environments of a shop system, making it easy to roll out updates or test out features on a staging system. 1 click deployment and slack notifications. Does not work with Python apps like Django or Flask. * We monitor all Deploybot reviews to prevent fraudulent reviews and keep review quality high. We do not post reviews by company employees or direct competitors. Validated reviews require the user to submit a screenshot of the product containing their user ID, in order to verify a user is an actual user of the product. Hi there! Are you looking to implement a solution like Deploybot?